Both men came from solid middle-class Midwestern stock. But Fitzgerald had gone to school with the rich boys and knew them intimately: the sporty banter, the careless air of inherited privilege, the ineffable (to use a favorite Fitzgeraldian word) assumption that life’s jigsaw puzzle would magically assemble itself for them while the middle-class boys sweated over hundreds of disjointed pieces. As for the working class and poor, nobody even thought to give them a puzzle. Back in 1912, when Fitzgerald was growing up, many upper-class Americans still rolled their R’s when they spoke. They were almost uniformly Anglo-Saxon, solid of character, starchy of manner and supremely confident of their own worthiness to lead. The Gilded Age was already giving way to the Progressivism championed by the likes of Theodore Roosevelt and Woodrow Wilson, but you’d never know it from gazing upon the lifestyles of the rich and the hardships of the poor. In terms of class distinctions, America was giving the Mother Country a run for her money. The Titanic lives on as the embodiment of all that was magnificent, unfair and ill-fated about the society that produced her. More colossal than any other manmade moving object in history up to that time, she measured 882 feet from bow to stern. If stood on end, the Titanic would have topped New York’s Metropolitan Life Insurance Tower (the world’s tallest building in 1912) by almost 200 feet. First-class passengers aboard the Titanic paid up to $120,000 in today’s money for a one-way ticket on the maiden voyage that April. They’d revel in luxuries comparable to those of the finest Gilded Age hotels: a Turkish bath, squash courts, a swimming pool, a lending library, and impossibly sumptuous ten-course dinners — each course accompanied by a different wine or spirit. (No wonder the rich were stouter then… and undoubtedly a little tipsier.) The lavishly crafted mahogany furniture and marble toilets gave them bragging rights over the plain folks in second class (with their ordinary porcelain toilets) and the poor proletarians in steerage (cast iron — and only two bathrooms for the lot of them). The Titanic was designed to be virtually unsinkable, of course. The mighty White Star liner would stay afloat even if four of her 16 watertight compartments were somehow breached simultaneously… an almost impossible scenario, everyone agreed. But, as we all know, the unthinkable happened: a lone iceberg lurking like a mugger in the night… a last-minute sighting from the crow’s nest… the desperate attempt to avoid a collision… the sickening sound of ice ripping a 300-foot gash along the pristine ship’s starboard hull… the flooding of five watertight compartments, which started a chain reaction that doomed the “unsinkable” ship… the frigid water lapping over the bow and creeping ever higher… the helter-skelter deployment of half-empty lifeboats… the ship’s gallant eight-man orchestra playing calmly amid the screams and panic… acts of heroism, kindness, cruelty and cowardice… the groaning and cracking of the hull as its contents rolled and crashed inside… hundreds of glittering lights suddenly going black… the surreal sight of the great stern and its three gargantuan propellers pointing straight into the air… the final, terrifying plunge beneath the North Atlantic to a final resting place twelve thousand feet below. And of course, more than fifteen hundred lives lost — the rich and powerful along with the poor and meek (but mostly the poor and meek). So many “if-onlies” to be contemplated: If only the crew had spotted the iceberg half a minute sooner… or had managed to steer clear of it with seconds to go… or had let let the knife-edge of the bow crash into it. 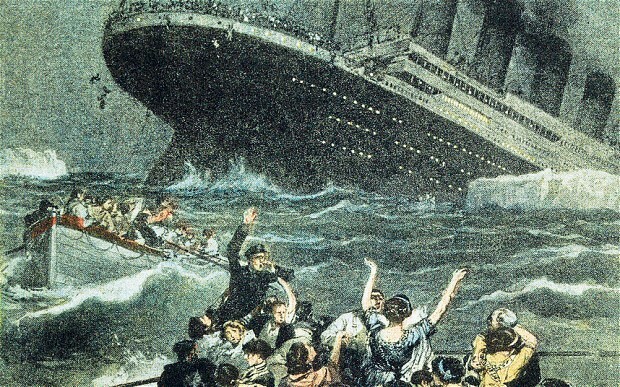 If only the gash had extended along four compartments instead of five… if only there had been enough lifeboats for everyone on board… if only the SS Californian, which was close enough to see the Titanic’s distress flares, hadn’t been so clueless and had gone straight to the rescue. Change a single one of those variables and few if any lives would have been lost. But only science fiction writers can tamper with history. Too late now. 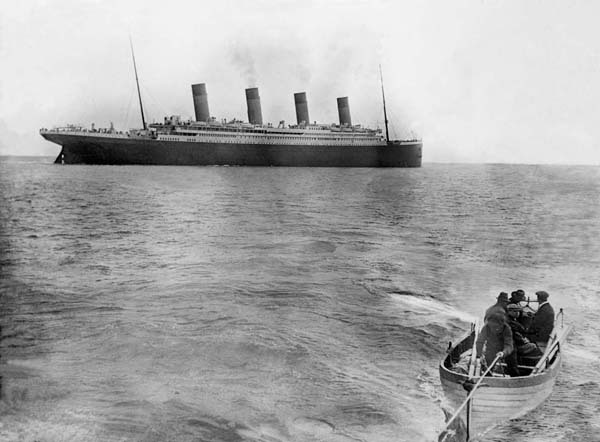 As a multipurpose metaphor, the Titanic has few rivals. No wonder her story still holds us spellbound… no wonder we still feel so intimately connected with her a century later. I probably won’t be the first or the last writer to compare the Titanic with the state of America in our time, but the comparison is irresistible. That makes four compartments already breached, and we don’t know how many it will take for the United States to founder. But if it does, all those comfortable first-class passengers in the upper decks will be forced out of their accommodations and into the bitter night air. Of course, they also get first crack at the lifeboats. In our angry, fragmented, severely compromised republic, the extremes now dominate the discourse: free-market apologists and Occupy Wall Streeters, fanatical fundamentalists and snarky atheists, white racists and black race-card players. Even the middle is growing tainted: instead of open-minded thinkers intent on reforming a corrupt system that caters to special interests and big money, we have Mitt Romney facing Barack Obama — two political and financial insiders intent on perpetuating the system for other political and financial insiders (though at least Obama makes a few feeble overtures toward our dispossessed 99-percenters). Yeats was writing in 1919 — just a year after the Great War ended, and seven years after the sinking of the Titanic. 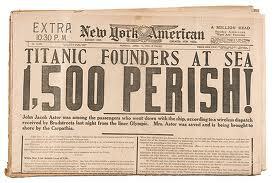 But his words should haunt us the way the Titanic still does, a century after that magnificent ship went down.